The former Soviet Union was a master at developing air defense systems. From the days of Vietnam where US airmen first encountered the SA-2, through the days of the SA-6 and the Israeli Air Force, these systems exacted a heavy toll in aircraft and crew until tactics and technology could be developed to counter them. When the US Army started developing the SAM-D air defense system, the Soviet Union began the development of a similar capability that was later NATO-designated as SA-10 Grumble. In fact, the SA-10 was fielded well before the troubled SAM-D program would emerge as the Patriot system. The SA-10 has been around for a while now though the system hasn't been encountered in combat (yet). A number of SA-10s have been exported around the world and Russian developers have improved the performance of the system to the stage that the latest update was redesignated as SA-20. According to several sources online, SA-10 air defense system (referred to in Russia as the S-300PMU) system is comprised of an acquisition radar code-named 'Clam Shell', a tracking/guidance radar code-named 'Flap Lid', two types of transporter/erector/launchers (TELs) that carry four canisterized SA-10 missiles each, plus a number of support vehicles. Initially, the system was trailer mounted, similar to the Patriot. 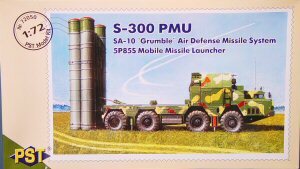 However, after several cycles of improvement of the SA-10 system, the decision was to make each of the prime components of the S-300 PMU self-propelled (mounted on a vehicle chassis). This mobile version was designated as SA-10B. The prime mover for the radar and TELS is based upon the MAZ-7910 8x8 chassis. There are two types of TEL are used with the SA-10B system: a 'smart' TEL with an control booth located between the MAZ's crew cab and the missile canisters; and a 'dumb' TEL that is identical to the smart TEL in configuration except for the control booth. The TELs move their missiles with the canisters stowed in the horizontal position, then launch the missile(s) with the canisters elevated to the vertical. The SA-10 was first operational around 1980 and has been rumored to be exported in China and several other countries. This is the same system that has been in the news with possible export sales to Iran and Syria. Who would have thought we'd see a modern Russian air defense system in kit form? 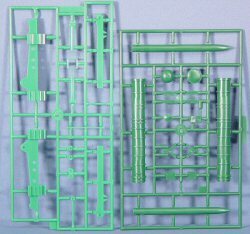 The first and only instance (until now) was the Airfix 1/72 SA-2 Guideline that has long since been out of production. Trumpeter has recently released the SA-2 and has announced an SA-6, both in 1/35 scale, but by now these are both old systems. Zvezda has announced a 2S6 which combines a air defense gun platform with the short-range SA-19 missiles, but that has yet to be released. 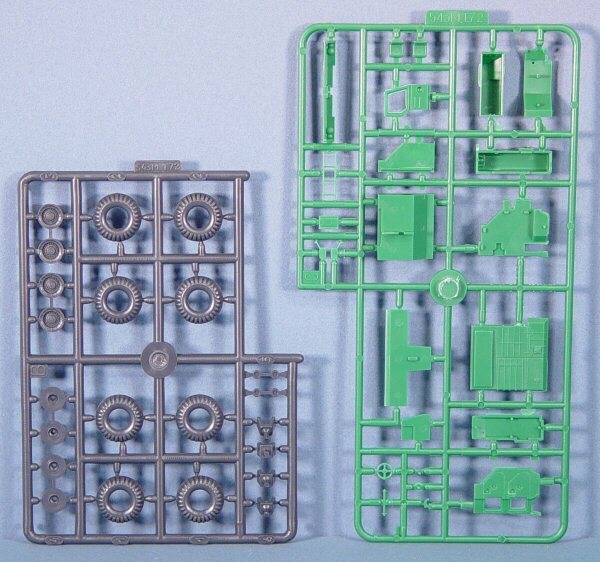 Not to forget DML's SA-9 and ZSU-23-4 kits in 1/35 which are nice representations of older tactical air defense systems. Here is PST from Belarus (a former member of the Soviet Republic) with the SA-10! Not the early trailer-mounted versions, but the current MAZ-7910 version! What's more, this is the first kit of the self-propelled TEL. This kit represents the 'smart' TEL (with electronics shelter behind the MAZ crew cab). 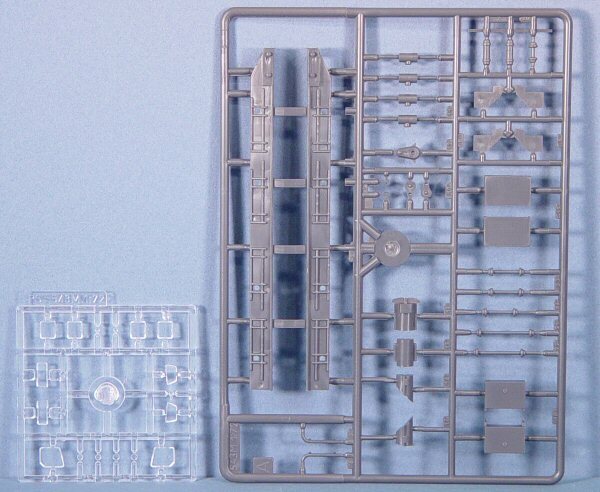 For those of you who track the article (izdelie) numbers, this kit represents the 5P85S. It is based on the MAZ-7910 chassis, which is has been nicely represented with its eight-wheel-drive power train. The crew compartment is nicely represented with tandem crew seats. On the deck behind the cab and engine is an operators' shelter and electronics support bay. Behind the shelter are additional electonics bays and a power generator.. The four missile cannisters are mounted behind this shelter and are hinged to be raised and lowered after assembly. For some unknown reason, PST provided missiles for each of the four cannisters, though these are not visible (nor needed) after assembly. 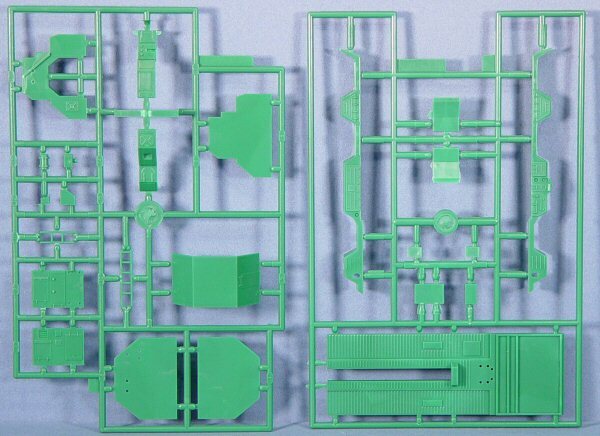 The bottom image to the right shows one of the four included sprue trees with the cannister halves, end caps, and a complete missile (duplicate trees not shown). 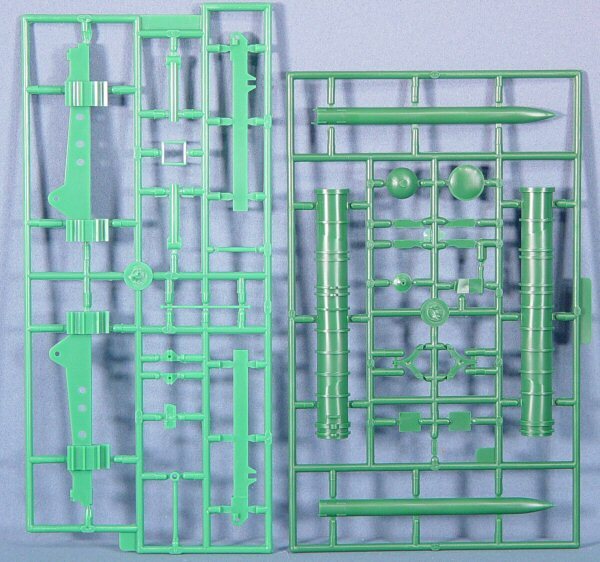 While there are no markings provided (nor needed) for this kit, and the instructions indicate a two-green and brown camouflage, though you can revert to the monocolor matte Russian Green color if you'd like. I hope PST won't stop here with the SA-10. For those of us who are interested in air defense systems and have been frustrated by the lack of decent kits, this is a great start! Check out the SA-10 'Flap Lid' radar and Dumb TEL kits also reviewed here. 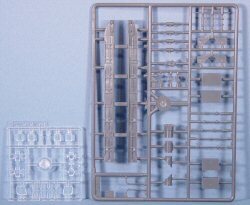 You can find this kit at your local hobby retailer or directly from Squadron Mail Order (www.squadron.com).